So I know most of us have probably already checked out of summer now that Fall is just around the corner, but this recipe is so perfect for a summer lunch or picnic, and I couldn't pass it up! Once I got over my chicken aversion (which is actually still lingering but I can manage to eat this), I couldn't wait to try it. I personally love anything with lemon-flavor in the summer. I usually go the dessert route (surprise surprise!) but this time I switched it up after trying a variation of this recipe while visiting my family up North. I'm not saying it beats a lemon cupcake, but its still pretty delicious! Linking up with East Coast Chic and Home of Malones! In a medium bowl, combine all ingredients except for the chicken to make a dressing. (Or be like me and just mix them all at once!) Then add your chicken until it's completely coated. Refrigerate for at least one hour before serving. I added some cheese and spinach to this sandwich and it was so delicious! Using the greek yogurt instead of mayo does change the taste a little but its so much lighter and healthy for you. It's perfect if you are sick of your normal lunch routine at the office. So easy! Has anyone else had this before or have another favorite recipe for lunch? I feel like I'm always running out of ideas of things to make! This sounds so yummy! 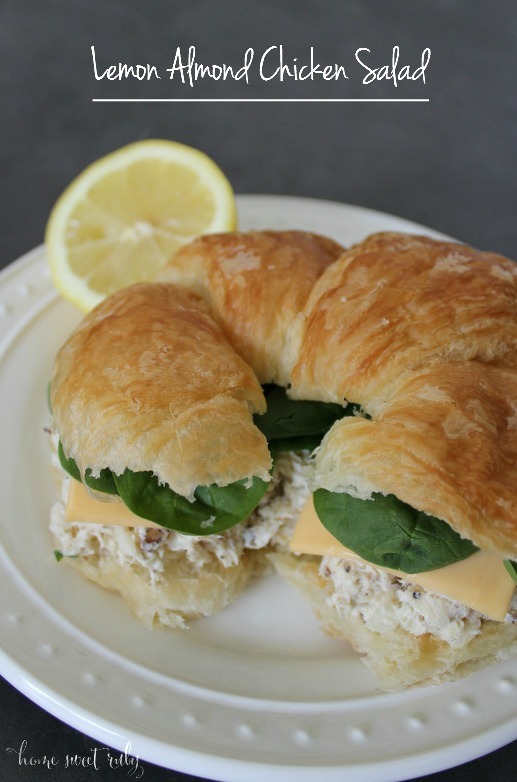 I love chicken salad and I love lemon so the two combined sounds amazing! Definitely trying this out soon! Sounds good. I love chicken salad but have never had it with lemon in it. This sounds so good!! Definitely going to try making this for lunch! This sounds amazing! We actually have leftover baked chicken right now, and this sounds like the perfect solution! Thanks for sharing. mmm you had me at chicken salad! I love trying new versions and I am always the one to order it if its on a menu just to see how it is! haha! 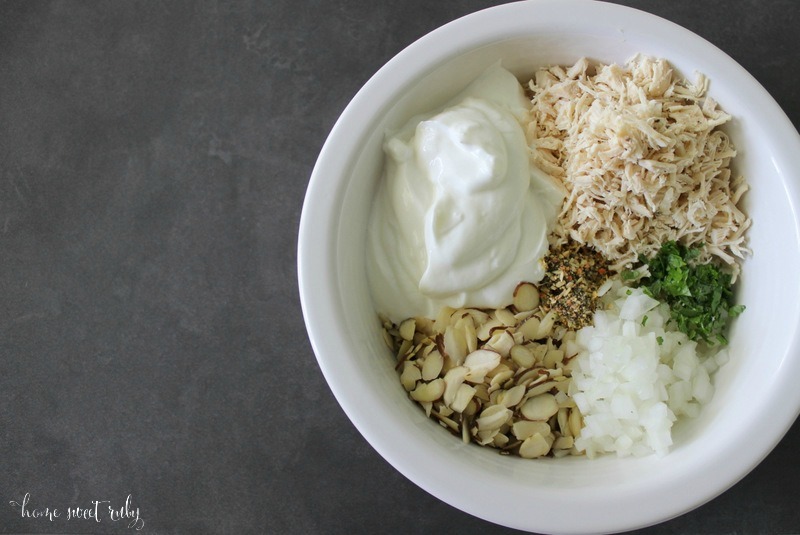 Genius to use Greek yogurt versus mayo! Sold. I love chicken salad. It looks delicious. Congrats on your baby on the way as well!! Thank you so much! :) This is definitely a favorite recipe of mine, very different than most chicken salads! This looks really good! I love some chicken salad and I've recently gotten Theo hooked too. We'll have to make it soon! I love chicken salad!! All kinds of chicken salads. I have to say that I usually splurge for the mayo because I think the yogurt does change it a bit, but I might give it another try! This looks amazing! Esp. served on a cresent! Thank you! It's a fiesta bowl, I love them! Yum, this sounds delicious! Definitely on my list to make before summer is over.